(Bloomberg) — South Africa has appointed six people to the commission of inquiry into allegations that the Gupta family was allowed to influence state decisions. Khotso de Wee, acting secretary-general in the office of the chief justice, Advocates Isaac Vincent Maleka, Leah Gcabashe, Paul Pretorius and Thandi Norman, as well as former Auditor-General Terence Nombembe will form the panel, Deputy Chief Justice Raymond Zondo, who chairs the commission, told reporters in Johannesburg on Wednesday. 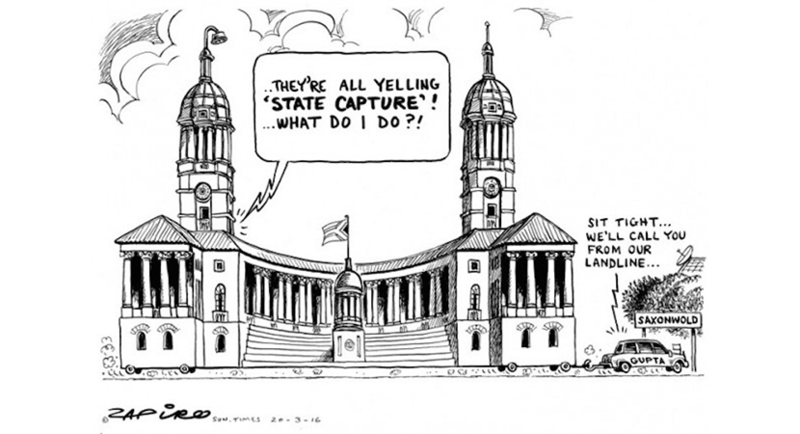 State Capture. 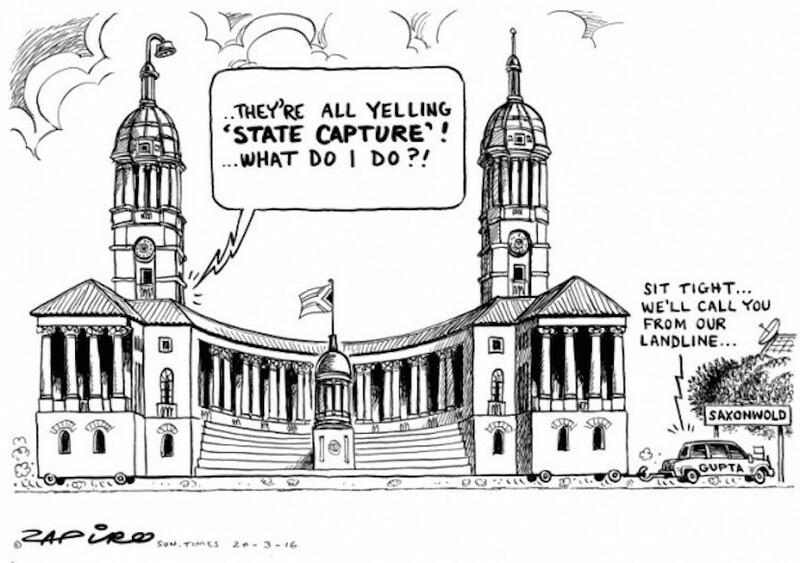 More of his magic work available at www.zapiro.com. The commission will investigate whether former President Jacob Zuma played any role in the Gupta family’s alleged offer of cabinet posts to people including former Deputy Finance Minister Mcebisi Jonas and other claims that they influenced state decisions. Zuma announced in January, when he was still president, that Chief Justice Mogoeng Mogoeng selected Zondo to head the probe. That follows a report and recommendations by former Public Protector Thuli Madonsela. She ordered the inquiry into allegations that the Guptas may have influenced cabinet appointments and received special treatment for a coal business linked to the family and one of the president’s sons. Zuma and the Guptas have denied wrongdoing. “Where it appears that there has been criminal conduct, the commission will make recommendations that the relevant authorities look into that issue and that where prosecutions are justified they should happen,” Zondo said. De Wee will be the commission’s secretary, while Nombembe will head up investigations, Zondo said. Pretorius will head the legal team while Maleka, Gcabashe and Norman will form part of that team, he said. The commission hasn’t set an exact date for the start of the hearings, and expects investigations to start in the next few months, Zondo said. “There is simply no way in which the commission can finish all the work it is supposed to do within six months,” Zondo said, adding that the presidency under Cyril Ramaphosa is looking into the issue.